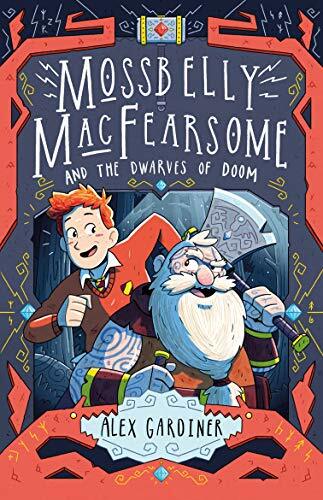 Alex Gardiner’s new fantasy adventure chronicles the heroic exploits of a warty, bearded warrior called Captain Mossbelly MacFearsome (Moss for short). His sudden arrival in a small town in the Scottish Highlands surprises local lad, Roger, and marks the beginning of an almighty war that could spell the end for the entire human race! Moss is captain of the subterranean race of dwarves who, through carefully maintained alliances with dragons and ogres, help ensure the survival of their unenlightened cousins - the human beings. But the secret alliance is under threat from the vengeful intentions of a furious, red-eyed dwarf - Leatherhead Barnstorm - who is hell-bent on destroying Mossbelly, whatever it takes. Leatherhead is flanked by an army of ‘gorefiends’: hilariously polite miniature demons made from the expelled gases of corpses. They may chop off your head but will complement your attire first! Amidst all this mystical mayhem is an ordinary schoolboy called Roger who, for all sorts of convoluted reasons, is destined to destroy Leatherhead’s doomsday sword and save humanity. Roger and Moss hurtle through the story, constantly escaping trouble then finding more trouble, picking up a number of helpful allies en route, from a magical Witchwatcher to a fumbling delivery driver called Wullie. Certain death is narrowly avoided more than once and there are moments of genuine jeopardy as the mighty Moss is incapacitated by Leatherhead’s powerful magic. Though much of this action is quite exciting, tension is repeatedly undermined by frequent comic interjections. Ill timed flatulence, toad-gobbing competitions, and, most of all, hilarious Dwarfish insults (‘poppnoddy’, ‘trundletail’, ‘mobard’ etc) ensure that the story never becomes too serious, even when the world seems certain to end. Younger readers may love the belligerent, barbaric behaviour of the dwarves (as well as the toilet humour) and there is ample action packed into the narrative to ensure engagement all the way to the end of the quest, though the balance of action and comedy is not always perfect. The end of the story is deliberately and unapologetically contrived to guarantee a sequel, so fans of Mossbelly’s warmongering and worm-eating will not have to wait long for his return.